The History Blog » Blog Archive » Better. Stronger. Faster. As previously threatened, I am officially marking The History Blog’s passing the six million pageviews milestone with a Steve Austin reference. That’s really the only reason I’m even announcing this particular milestone. One million I announced because it’s a big deal; five million because we got there a lot faster than I expected. The six million figure only means anything to me because to this day I remain inordinately fond of the Six Million Dollar Man, especially the intro. 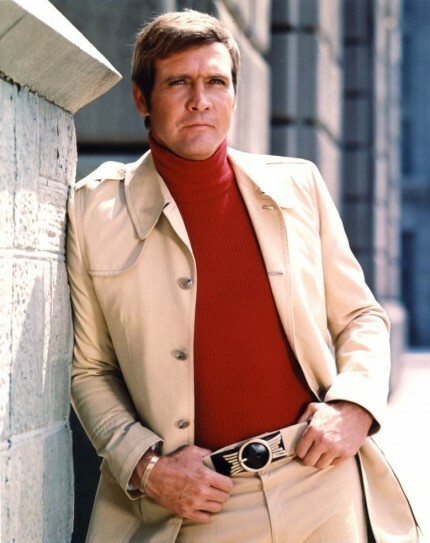 Also, that Lee Majors could wear the hell out of suits both track and leisure. This entry was posted on Tuesday, January 20th, 2015 at 10:00 AM	and is filed under Ex Cathedra. You can follow any responses to this entry through the RSS 2.0 feed. You can skip to the end and leave a response. Pinging is currently not allowed. Congratulations! I have enjoyed your interesting and informative blog for a little over a year now. Thanks. I won’t. This is the longest streak I’ve ever been on. That’s an excellent reason for a celebration. Congratulations! Thank you! I’m glad to see so much love for the great Steve Austin. Oh, I did. I ran very slowly in front of a mirror for like a minute. Love this blog!!!! And just look at Lee Major’s belt buckle! I know, right?! Could there be any better belt buckle in the world to accessorize a ribbed turtleneck and double-knit polyester beige leisure suit? Six million, a few reasons: You publish everyday, a very wide variety of topics, good graphics and your contempt for looters would be my favorite. Congrats on the number. Thank you kindly, norm. Sometimes I fear my lust for high resolution images has cross the line into a full-blown dragon-chasing addiction, but then I find a really great picture and forget all about it. Congratulations! Here’s to the next six million! Thank you! May the views proliferate like unto the hairs on Lee Major’s chest. Thanks for keeping us enlightened! This site is my first stop each day. I’m honored to be the official accompaniment of your complete breakfast. Congratulations! I look forward to this blog everyday! LOVE this blog. It’s my favorite among several that I follow. Love the heck out of this post. Thank you! I didn’t realize Steve Austin would engender such a great response. When will I learn never to underestimate the power of the Bionic Man? nuh nuh nuh nuh nuh nuh nuh nuh! I once worked on a tv commercial where an actor wore the orange jumpsuit Col. Austin wore in the opening sequence. I touched it. That’s right. I. Touched. The. Actual. Jumpsuit. And we walked it around the set like the holy grail for all to behold. Oh. My. God. I AM NOT WORTHY TO BE IN THE PRESENCE OF ONE WHO HAS TOUCHED THE ORANGE JUMPSUIT. Great, from around the world fresh news! Gorgeous high resolutions photos!I don’t know how you are surviving without adds but I love this site! Thank you! My ancient theme is so technologically moribund that I couldn’t even take ads if I wanted to, which I don’t, so it all works out. My Steve Austin action figure stands proudly on a shelf across the room, so my admiration for this blog has only reached new heights by this post. Ooh! Ooh! Is it the one with the bionic eye and engine block, or the one with the bionic eye and bionic grip? Congratulations! The information you impart through this blog is endlessly fascinating! Thank you for being fascinated by the same things that fascinate me. Probably my favorite blog, year after year—and I’m always reading 30 or 40. But was there ever a time when it was a blog barely alive? There was, actually. I had a false start in June of 2006. Those first entries were so short as to be basically just links to news stories, and I contented myself with whatever trash thumbnail image was in the linked article. I lost interest after a few entries and didn’t pick it up again for almost a year and a half. But we rebuilt him! We had the technology! Zomg. I hadn’t thought of that engine block in probably three decades but pop! There it is in the mind’s eye, complete with awkward arm articulation. Yes! I wasn’t fortunate enough to have an engine block Steve Austin of my own, but I’ve never forgotten its combination of randomness and awesomeness. Does anyone know the designer of his belt?